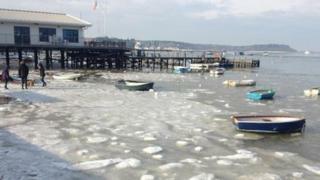 The severe cold has led to the sea freezing near to the coast in Dorset's Sandbanks resort. The AFC Bournemouth and Exeter City match on Saturday has been rescheduled for Tuesday as the pitch at the Seward Stadium is frozen. Dorset councils will send out gritting crews overnight as ice and snow is predicted by the Met Office. Dorset County Council will be updating its gritter twitter feed to keep people informed. Bournemouth Council says its teams of gritters will work 24 hours a day, seven days a week to keep traffic moving in the event of severe weather. The council says it has 1,800 tonnes of road salt in stock. Bournemouth will also be issuing gritter alerts on Twitter with the username @bournemouthbc.